Developmental disabilities are a group of conditions due to an impairment in physical, learning, language, or behavior areas. These conditions begin during the developmental period, may impact day-to-day functioning, and usually last throughout a person’s lifetime. Examples of developmental disabilities include cerebral palsy, muscular dystrophy, and autism, to name a few. Children with developmental disabilities do not reach certain developmental milestones. Children reach milestones in how they play, learn, speak, behave, and move (for example, crawling and walking). Children develop at their own pace, so it’s impossible to tell exactly when a child will learn a given skill. However, the developmental milestones give a general idea of the changes to expect as a child gets older. If a child is not meeting the milestones for his or her age, it may be a sign of a developmental disability. Most developmental disabilities are thought to be caused by a complex mix of factors. These factors include genetics; parental health and behaviors (such as smoking and drinking) during pregnancy; complications during birth; infections the mother might have during pregnancy or the baby might have very early in life; and exposure of the mother or child to high levels of environmental toxins, such as lead. For some developmental disabilities, the cause is never known. By clicking this box, I certify that I have read and understand the disclosure, and that I am giving my written permission to be contacted by an Authorized Quantum Rehab Provider to further discuss my mobility needs. How is a Developmental Disability Diagnosed? A child’s growth and development are followed through a partnership between parents and health care professionals. At each well-child visit, the doctor looks for developmental delays or problems and talks with the parents about any concerns the parents might have. This is called developmental monitoring. Any problems noticed during developmental monitoring should be followed up with developmental screening. Developmental screening is a short test to tell if a child is learning basic skills when he or she should, or if there are delays. How is a Developmental Disability Treated? In addition, if there are other disabilities present, medical or surgical treatments may be required to manage those conditions. The child’s progress depends in large part on the underlying diagnosis for the developmental delay. Early identification and treatment will optimize a child’s progress. Some children may “catch up” to peers over time while others may have disabilities that persist into adult life. Many of these adults may be independent in their function, some individuals may have mild disability requiring limited societal supports, and others may require extensive supports due to the extent of their disability. A minority of children might be diagnosed with a “progressive” condition (one that causes further injury to the nervous system over time) in which case, the child may plateau or regress in their development due to that condition. Still, with support, the child’s function can be optimized. Some children with developmental disabilities require the use of a specialized power wheelchair. Quantum Rehab®, the global leader in individualized power chairs, puts an emphasis on mobility technologies specific toward the needs of those with developmental disabilities. Quantum Power Chairs incorporate power-adjustable seating for user repositioning and comfort; specialty drive controls, including those requiring minimal hand strength; and, a highly-adaptable design to meet an individual’s current and future needs. 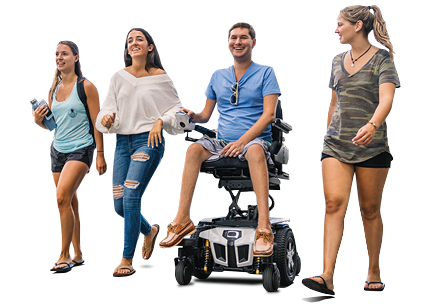 Quantum Power Chairs feature the latest advanced technologies to increase the independence of those living with developmental disabilities. iLevel® seat elevation technology allows a user to operate the power chair at seated or standing height. Bluetooth® is also integrated into Quantum’s Q-Logic 3 electronics, so those with developmental disabilities can operate much of their environment with the power chair drive control, itself. For those with developmental disabilities, Quantum Power Chairs are designed to provide optimal medical comfort and maximum independence. Please click here for more information on Quantum Power Chair solutions for those living with developmental disabilities. The Bluetooth® word mark and logos are registered trademarks owned by Bluetooth SIG, Inc. and any use of such marks by Quantum Rehab is under license. Other trademarks and trade names are those of their respective owners.